A version of the following article first appeared in Irish Lives Remembered Genealogy Magazine (July 2013 issue). I have to admit, when my older sister Regan says this, as she does from time-to-time, I feel a tinge of satisfaction. Younger sisters will understand how years of childhood rivalry can spill over into adulthood and we briefly allow ourselves to revel in the tiniest of victories. A card game won, a promotion at work, or in my case, a story my grandma told me. 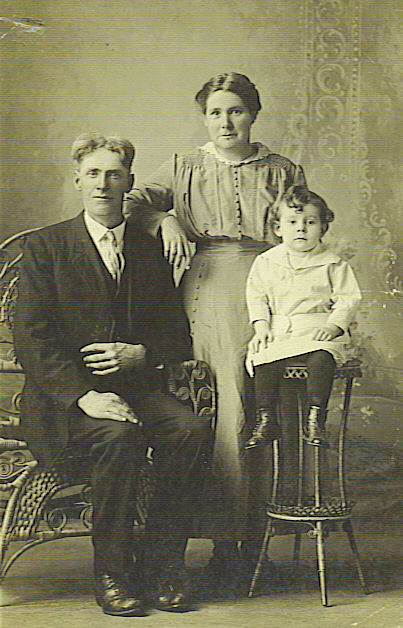 Thomas Edward McMahon, my great-grandfather, was born on June 13, 1879, in Tara Township, Minnesota. Tom was the second child and eldest son of Francis and Catherine (McAndrew) McMahon. His father was a native of County Fermanagh and his mother was born in New York – her parents came from County Mayo in the 1850s. My grandma was Agnes McMahon Regan, Tom’s youngest daughter. Grandma said her dad was warm and generous. His family and friends could depend on Tom to be there when they needed him. No one was better in a crisis. Grandma smiled when she said that in the end, her dad was at heart, a big kid. He loved to play with his children and his easy manner lead to lots of jokes and laughter. Tom enjoyed nothing more than sitting in his chair in the evening, surrounded by his family as his wife, Mary, read aloud from Treasure Island or Little Women or whatever novel the mobile library offered that month. 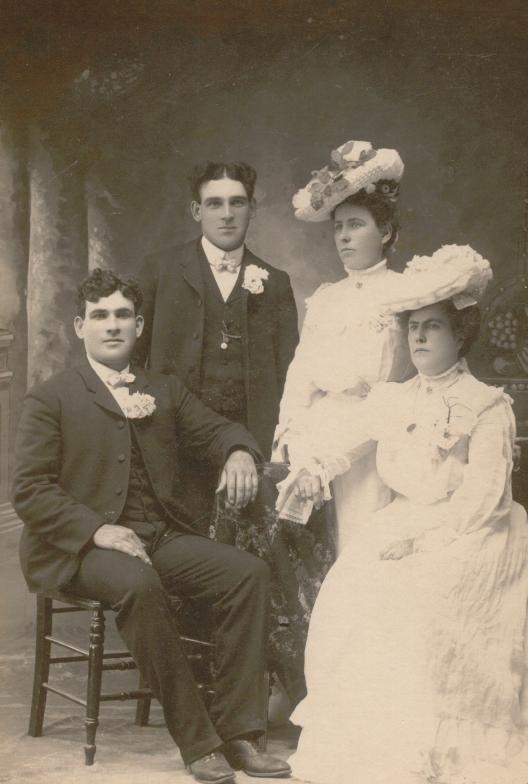 Tom wed Mary Foley on June 9, 1904, at St. Malachy Catholic Church in Clontarf, Minnesota. The couple grew up a mile apart on farms in Tara Township and were childhood friends. Tom’s nickname was “Hoosie” and Mary was “Minnie”. They had seven children – four girls and three boys. Grandma said her dad was so good-natured, he never raised his voice. “Never?” I asked. A natural question. “Well…there was one time…” And we’re off. Tom was taken aback. None of his children behaved so rudely, not even his spirited middle child, Rose. But he was especially surprised by the outburst from Agnes. Tom told her she could have the butter if she asked for it nicely. The two of them sat on the buggy while Grandma ate her dinner. She still felt terrible, but she had learned her lesson. Looking back, Grandma thought her dad felt as bad as she did that he raised his voice. He never did it again. And Grandma learned some table manners. According to Grandma, her dad was a true farmer. He loved everything about the process – preparing the soil, planting, growing crops, harvesting them, and sharing the fruits of his labor. 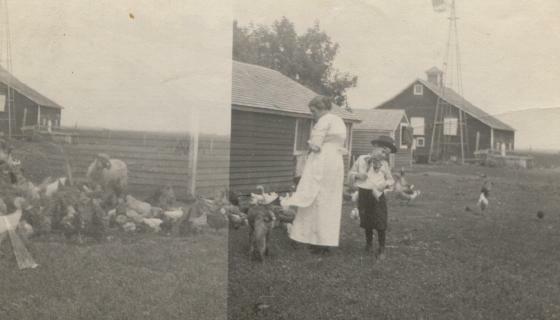 Unfortunately, the 1910s and 1920s were tough on many farmers on the prairie of Western Minnesota. Tom tried to make a go of it several times. 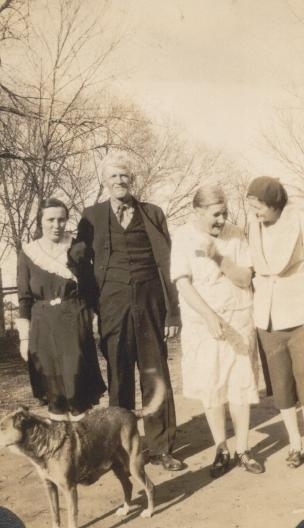 He sold the homestead and moved to rented land, farming until 1926 when he gave it up for the last time. The McMahon family moved to Minneapolis to begin life anew. In the city, Tom worked at the pole yard, treating and preparing new telephone poles. When he retired, a neighbor allowed Tom to use a nearby vacant lot for a garden. Tom returned to what he loved. He grew enough produce to trade with the local shop for groceries and feed his family and neighbors. He had never been happier. Tom McMahon died on May 6, 1937. His wife, Mary, came home after a rare afternoon away from home to find him peacefully in his chair, rosary entwined in his fingers. A heart attack took him quickly. Listening to Grandma’s memories of her loved ones brought them to life for me, and at the same time allowed me a glimpse at my grandma. I never had the privilege to meet my great-grandfather, but I feel like I know him. I was lucky to know my grandma. Now it’s my job to keep and share my grandma’s memories and her stories for the rest of the family. You just have to ask. Categories: Irish American | Tags: butter, Clontarf, family, farming, Fermanagh, McMahon, Minneapolis, Minnesota, pole yard, table manners, Tara | Permalink. John Foley and my grandpa John Regan were good friends. 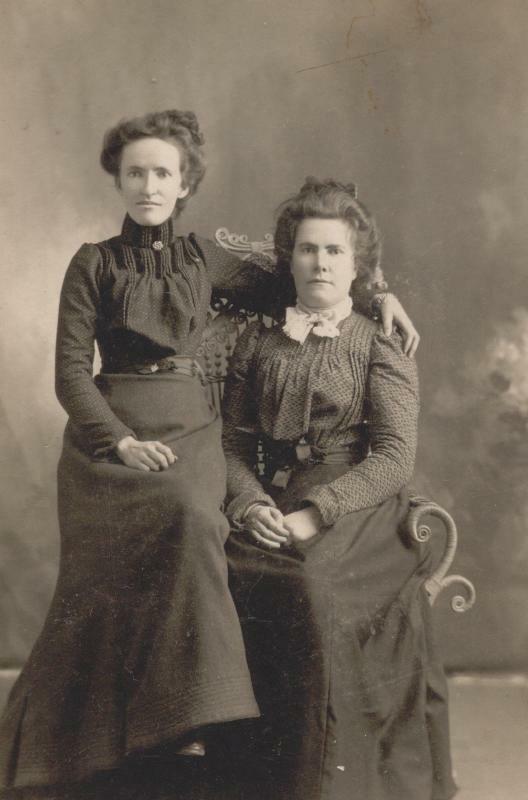 They spent their early childhood together in Clontarf, Minnesota. 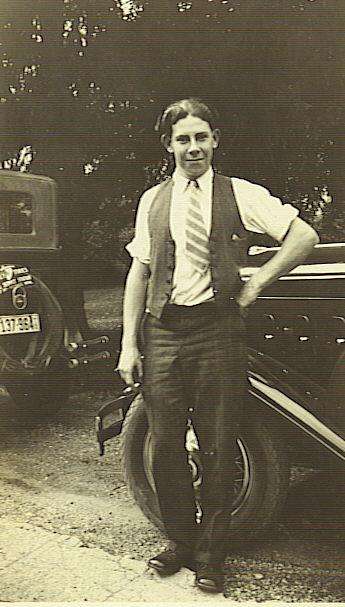 John Foley moved to Minneapolis with his family in the mid 1920s. It was only natural that the two boys were friends. 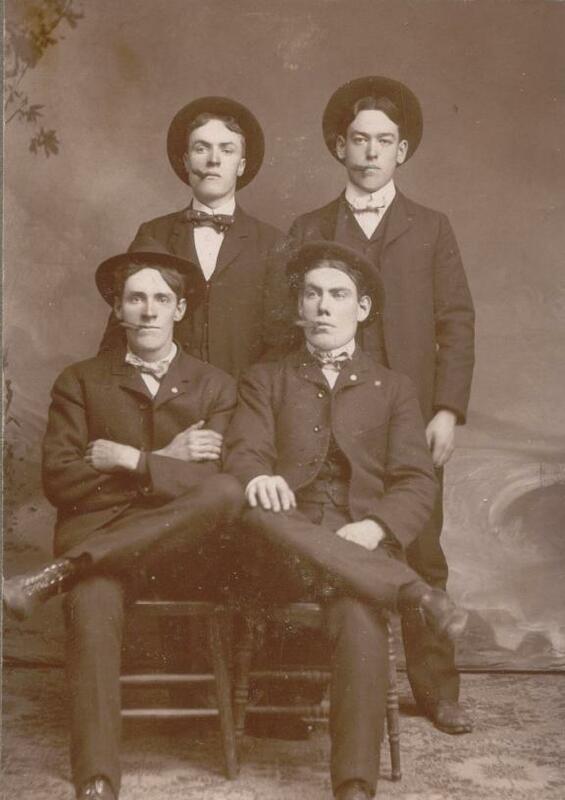 Their paternal grandfathers (Patrick Foley and John Regan) were friends in their native Kilmichael, County Cork, and they came to America together, settling in Fisherville, New Hampshire before venturing to Clontarf, Minnesota in the late 1870s. I don’t know if “the Johns'” fathers (Tim Foley and Neil Regan) were friends when they were young. Clontarf was (and is) a small place, but from what I have heard, the two had little in common. If I consider as evidence my grandma’s collection of studio portraits of many of the young men of Clontarf, Tim and Neil were not close. – there are no photos of the two of them together. However, the evidence does show that John’s uncle John Foley and Neil were friends (see below and click here to read about it). One day in late 1930s Minneapolis, my grandma’s Aunt Bid Foley (John Foley’s mom) invited her over for cards. Have I mentioned yet that John Foley and my grandma, Agnes McMahon were first cousins? How about that they were double first cousins? John Regan was staying with his old friend John Foley at the time of the invitation. Agnes and John Regan had crossed paths over the years, but it wasn’t until Uncle Tim asked Agnes to take his place in a cribbage game with John Regan, that sparks flew. I don’t know who won that game, but I bet it was fiercely contested. They fell in love over a cribbage board and were married in 1941. They were a perfect couple. 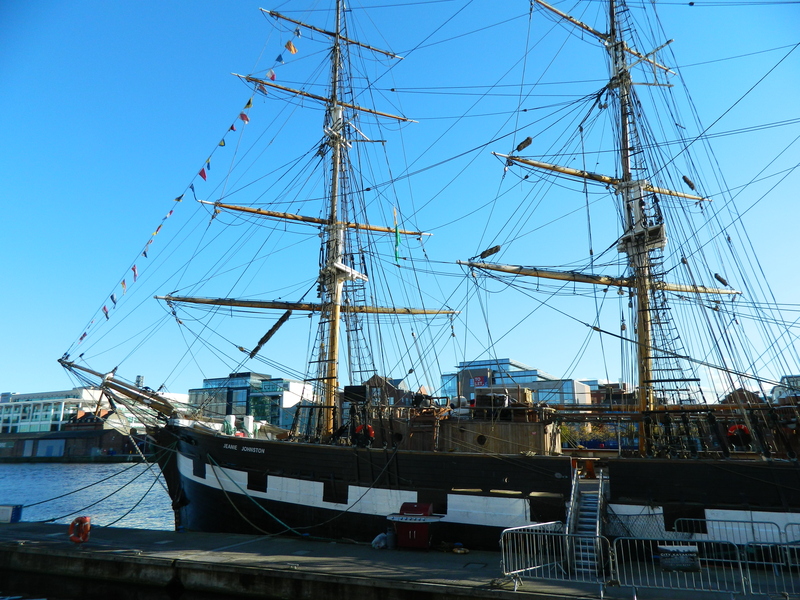 Agnes’ maternal grandfather was Patrick Foley and John Regan’s paternal grandfather was….John Regan. The two friends from Kilmichael, County Cork. 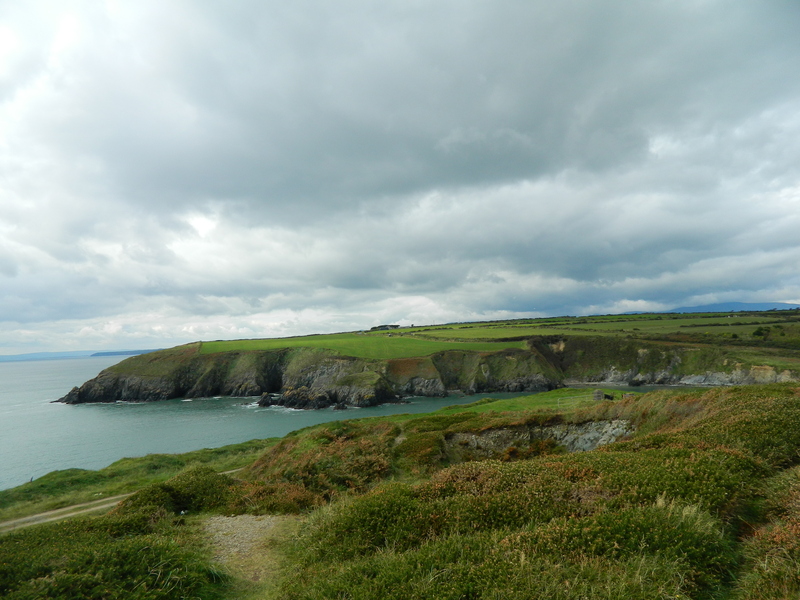 When we visited Kilmichael Parish in Cork, Ireland several years ago, we learned that the connection between Patrick Foley and John Regan may have been stronger than we thought. John Regan’s mother was Ellen Foley. Patrick and John were cousins. I thought this was very cool. Then my sister mentioned how that would have made grandma and grandpa some sort of cousins, too. Distant, of course, going back to their great-grandparents generation. In 19th century rural Ireland that must have happened a lot…right? Distant cousins, yes, but friendship connected the Foley and Regan families through the generations, across an ocean and into a new world. 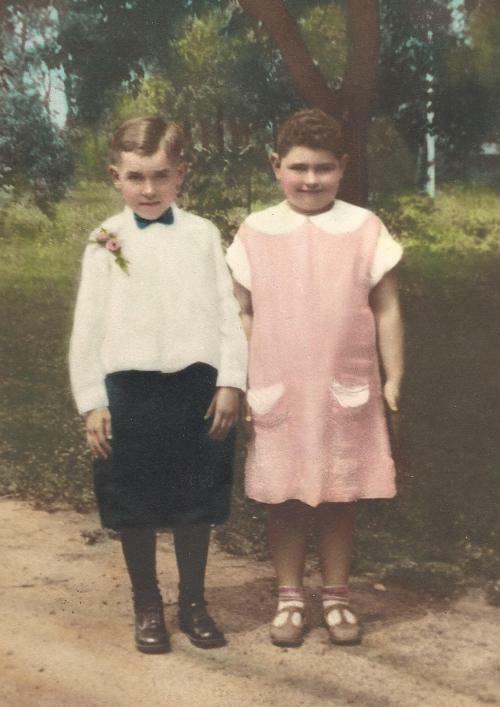 And I didn’t even tell you how my grandma’s mom and grandpa’s aunt were life-long besties…. Categories: Irish American, Uncategorized, Where they went | Tags: Clontarf, Cork, cousins, Foley, friends, Ireland, Kilmichael, McMahon, Minneapolis, Regan, weddings | Permalink. They say that one of the first steps to learning about your family history is to talk to your oldest living relatives. They actually knew the people behind the names in your family tree print-out. These relatives have stories to tell, memories to share. Nearly ten years ago my mom and I set out to learn more about our family and arranged to meet two of my grandpa’s cousins – Donald and Gerald Regan. The brothers taught us much more than we thought possible about my grandpa, the entire Regan family, and growing up in Clontarf, Minnesota . Donald passed away last month, one day shy of his 96th birthday. He was a loving husband, father, and grandfather, a proud Navy veteran of World War II, a successful businessman, and a former mayor of DeGraff, Minnesota. Donald was friendly, outgoing, and charming. He loved to be in the mix and hear the latest news. Donald’s brother Gerald said he inherited these traits from the “Regan side” of the family. I will miss Donald’s delightful gift for storytelling and am grateful I had the chance to listen. Donald and his sister, Kathryn. The first time I met Donald in early 2004*, he brought my mom and me on a driving tour of Tara Township. As we drove out from Clontarf, with what seemed to me to be an endless expanse of land on either side of the road, Donald began telling us who lived and farmed each section, beginning with the original nineteenth century settlers through the present-day owners. From the front seat, his brother Gerald filled in the gaps. I was in awe – I didn’t even know the names of the forty other residents of my condominium! As we slowly rounded a corner, Donald pointed out a grove of trees set off from the road, and he stopped the car. John was my grandpa and Donald’s first cousin. 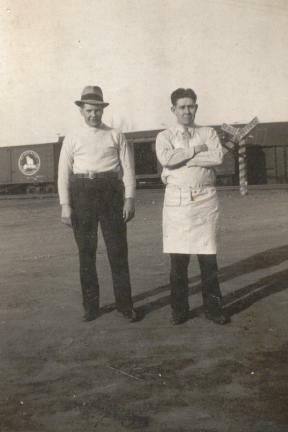 Donald and Gerald grew up across the railroad tracks from my grandpa in Clontarf. Donald took a sharp turn into the “driveway” – a muddy springtime mess of rocks and decaying twigs. I was certain we would get stuck, but Donald knew what he was doing. We got out of the car and walked up to the house. Donald made sure we didn’t get too close, it wasn’t safe. There was my grandpa’s birthplace, glass gone from the windows and walls gently caving in, but still standing thanks to that grove of trees. Several years later, when Donald had moved into the Manor in Benson, he navigated his scooter down to the Whistle Stop Cafe to meet us for lunch, with the same purpose and confidence with which he drove up to Grandpa’s house that Spring day. I liked how Donald maintained his independence – with a touch of determination. Mom and I came to town a couple of times a year, meeting Donald and Gerald for lunch and a chat about “old times”. Without fail, Donald and Gerald dazzled us with entertaining tales of life in Clontarf. At each meeting with the brothers, I waited patiently for Donald to break out his “Annie voice”. In a high-pitched tone he would say, “Oh, Sonny!” mimicking my great-grandmother Annie Hill Regan’s chastising her son for some transgression or another. I simply loved how Donald scrunched up his nose and exclaimed this phrase with a twinkle in his eye. This meant the world to me, and I think Donald got a kick out of it as well. Donald helped fill in the gaps in our family history left by my grandpa’s early passing. My mom and I were a captive audience as Donald and Gerald reminisced about old times. As Donald helped me get to know my grandpa through his memories, he gave me a special glimpse into his own life. The Donald who was a protective older brother to Kathryn, a boy earning a little extra money sweeping out the furnace at McDermott’s in Clontarf with his brother Gerald, and Julia’s youngest son. We were lucky that Donald was so generous with his memories, his time, and his friendship. Rest in peace, Donald. *I am sure I met Donald in the 1980s at a Regan Family picnic, but I didn’t get to know him until Spring of 2004 when my mom and I first visited Clontarf together. Donald W. Regan, 95 of Benson died Friday, September 13, 2013 at Meadow Lane Nursing Home in Benson. Mass of Christian burial will be 10:30 a.m. Saturday, October 5, 2013 at St. Bridget’s Catholic Church in DeGraff. Burial will be in the church cemetery. Visitation will be held from 4:00 to 7:00 p.m. Friday at the church with a rosary at 4:30 p.m. Visitation will continue on Saturday for one hour prior to the service. Funeral arrangements are with the Harvey Anderson Funeral Home in Willmar. 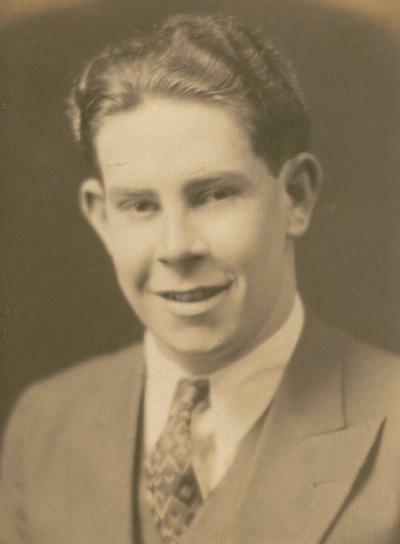 Donald William Regan was born on September 14, 1917 in Clontarf, the son of Patrick and Julia (Duggan) Regan. He attended Clontarf Elementary and Benson High School, graduating in 1936. 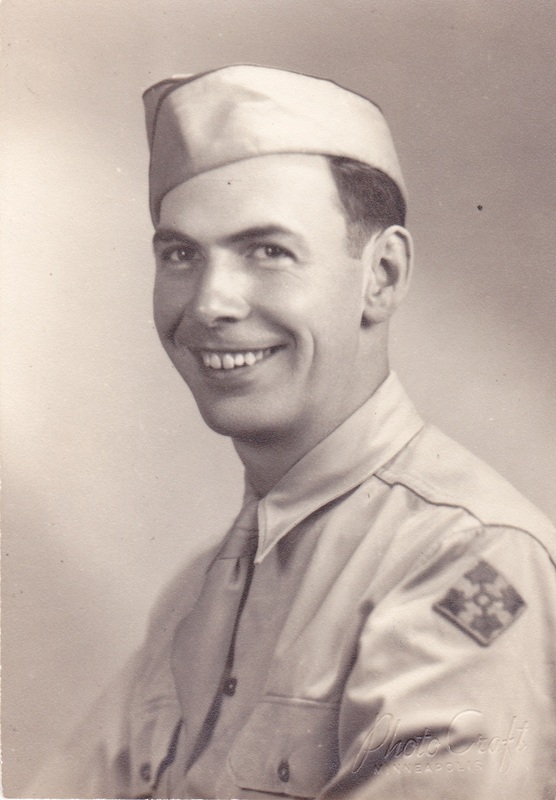 After his schooling he entered the U.S. Navy where he served his country during WWII. On December 27, 1945, Don was united in marriage to Margaret Helen Coy at the Catholic Church of Visitation in Danvers. They made their home in DeGraff where Don managed the DeGraff Lumber Company. They were able to share in 57 years of marriage before Margaret’s death on July 27,2002. Don enjoyed traveling, dancing, watching sports, especially Notre Dame football, Vikings and Twins. He was the Commander of the Hughes-McCormack Post of the American Legion until his death, was a member of Knights of Columbus and had served on the school board, city council and was mayor of DeGraff. Donald W. Regan died Friday, September 13, 2013 at Meadow Lane Nursing Home in Benson at the age of 95. He is survived by his children, William Regan of Benson, Julia (Everett) Richardson of Surprise, AZ, Dr.Timothy (Michelle) Regan of Santa Rosa, CA, Patrick Regan of Mpls, Duggan (Cindy) Regan of DeGraff and Daniel Regan of Blaine; 7 grandchildren; 3 step-grandchildren and 6 step-great-grandchildren. Don was preceded in death by his wife, Margaret; son, Bruce; siblings, Clarence, Howard, Catherine, Agnes and Marjorie. Categories: Remembrance | Tags: Benson, brothers, Clontarf, DeGraff, family, genealogy, grandpa, memories, Regan, Tara Township | Permalink. Today is my grandpa John William Regan’s 100th birthday. 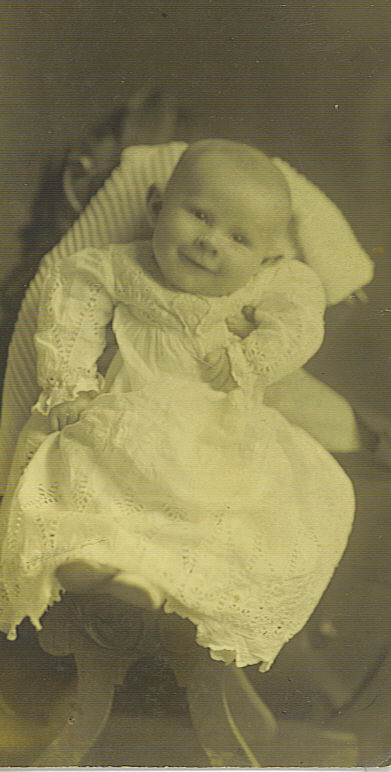 He was born on a farm in Tara Township, near Clontarf, Minnesota on July 23, 1913. John was the only child of Neil and Annie Hill Regan. Neil was a first-generation Irish American and Annie came from Kill, County Kildare. He was baptized at St. Malachy Catholic Church on August 10th. Grandpa had red curls. Annie kept his hair in long ringlets until Grandpa had ear surgery at age four and had his hair cut. John must have had fun helping his dad on the farm. John also kept Annie company on the farm. Annie doted on her son – you can tell by his dapper outfit! In 1921 the family of three moved off the farm and into the town of Clontarf. The eight-year-old John finally started school and Annie had John take violin lessons from a local musician. At school, my grandpa became known as “Red” Regan because of his hair. Soon playing ball and running around with the other boys took precedence over violin practice. Grandpa had a life-long love for cars and began driving at a young age. Grandpa graduated from Benson High School in 1933. He was a star on the football team. I guess that stands to reason since he was nearly twenty-years-old during his senior year! After graduation, Grandpa worked behind the bar at Bruno Perrizo’s in Clontarf. Here he is in his apron with childhood pal Leo Molony. My grandpa moved to Minneapolis in the late 1930s. He hit it off with Agnes McMahon over a game of cribbage at his friend (and Agnes’ cousin) John Foley’s place. John and Agnes were married in 1941. It’s strange to think of my grandpa’s 100th birthday because he didn’t even live to see his 58th. He passed away the year before I was born, but I am lucky to have learned about my grandpa through the memories and stories my grandma, mother, my grandpa’s cousins, and old friends shared with me over the years. I missed out on something really special – he would have been a fantastic grandpa! Categories: Birthday | Tags: Clontarf, grandpa, John William Regan, Kildare, Minnesota, Tara | Permalink. That’s what my great-grandfather Neil Regan used to say on Flag Day, June 14th. 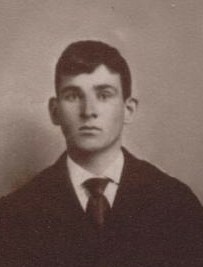 Cornelius “Neil” Regan was born on June 14, 1873 in Fisherville, New Hampshire, the oldest child of John and Mary (Quinn) Regan. He lived much of his life in the Clontarf area, arriving in Tara Township with his parents and siblings in 1879. 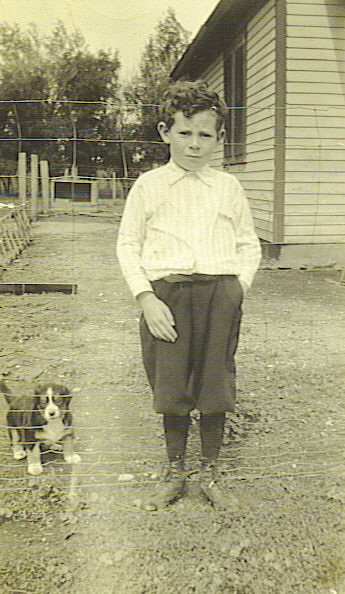 After years on the farm, he moved into Clontarf in 1921 where he lived for over twenty years before moving to Minneapolis in the early 1940s to live with his son John – my grandpa. There he would stay until he passed away in 1951. My mom, Eileen, remembers a dapper grandfather, dressed in a three-piece-suit every day and smelling of Listerine – Neil used Listerine to soothe pinching from too-tight nose pads on his glasses. Grandpa Neil read books to my mom. Her favorites were the Little Lulu comic books. Neil would say he had a genius on his hands when Eileen would take her turn and “read” these books to him. This was before she even started kindergarten. Of course, she wasn’t actually reading the books, she just memorized them! Mom said Neil was a quiet man, very mild-mannered. Most days, weather permitting, Neil would take the streetcar downtown to play cards in the park with the other old guys. Neil was also devout. His nephew Gerald Regan recalls seeing Neil, kneeling next to a chair on the back porch early in the morning saying his rosary. He continued this practice his entire life. Mom recalled waiting for Neil to come out of his room in the morning while he finished up his prayers. Gerald also remembers when my grandpa John would ask for money when he was young, Neil would get up, walk away, and pull out his wallet, inspecting its contents carefully before selecting the bills and handing them to John. Gerald always thought this a bit odd, but Neil was a very deliberate man, so he didn’t think too much about it. Only later did Gerald realize that Neil was not being circumspect at all, but rather the cataracts on his eyes made it impossible for him to see the bills in his wallet unless he had the light from the window. Shortly after Neil moved to Minneapolis he had the cataracts removed at the University of Minnesota. My grandma remembered how Neil exclaimed, “It’s a miracle! I can see!” Apparently all those early morning rosaries paid off! When Neil passed away on June 30, 1951, his wake was held at home. This was the only wake my mom ever remembered being in a home – by the 1950s the convention was to hold wakes at the funeral home. The front bedroom was cleared of furniture to make room for his casket and after waking for two nights, Neil returned to Clontarf, where he was buried next to his wife, Annie. When I see the flags decorating the porches and the boulevards in my neighborhood today, I will smile to myself and think it is all for my great-grandfather Neil. Another of my Irish American favorites. Happy Flag Day everyone and Happy Birthday Neil! Categories: Irish American Faves | Tags: cards, Clare, Clontarf, Cork, Fisherville New Hampshire, Listerine, Neil Regan, Tara Township | Permalink. 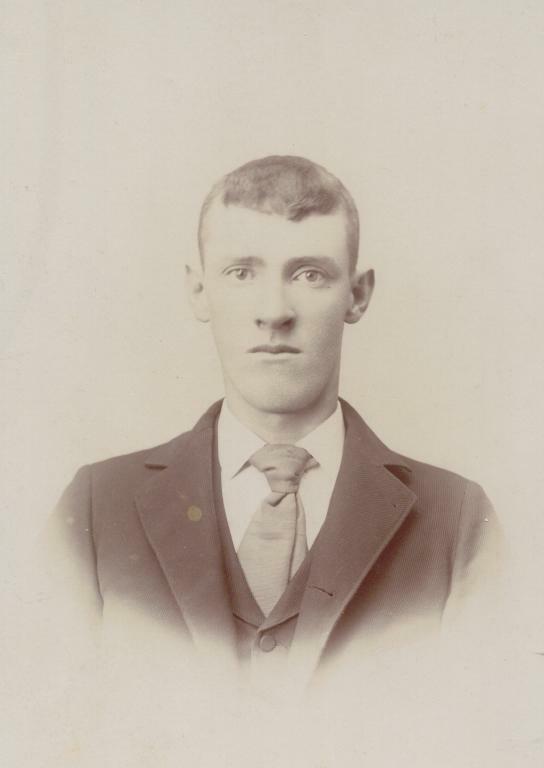 My great-grandfather, Thomas Edward McMahon, was born on June 13, 1879 in Tara Township, Minnesota. Tom was the second child and eldest son of Francis and Catherine (McAndrew) McMahon. His father was a native of County Fermanagh and his mother was born in New York – her parents came from County Mayo. His youngest daughter was my grandma, Agnes McMahon Regan. She loved her dad and shared her memories with me over the years. Grandma said her dad was like a big kid. He loved to play with his children and joke around, and enjoyed nothing more than sitting in his chair on a winter’s evening with the family as his wife, Mary Foley McMahon, read stories aloud to them all. 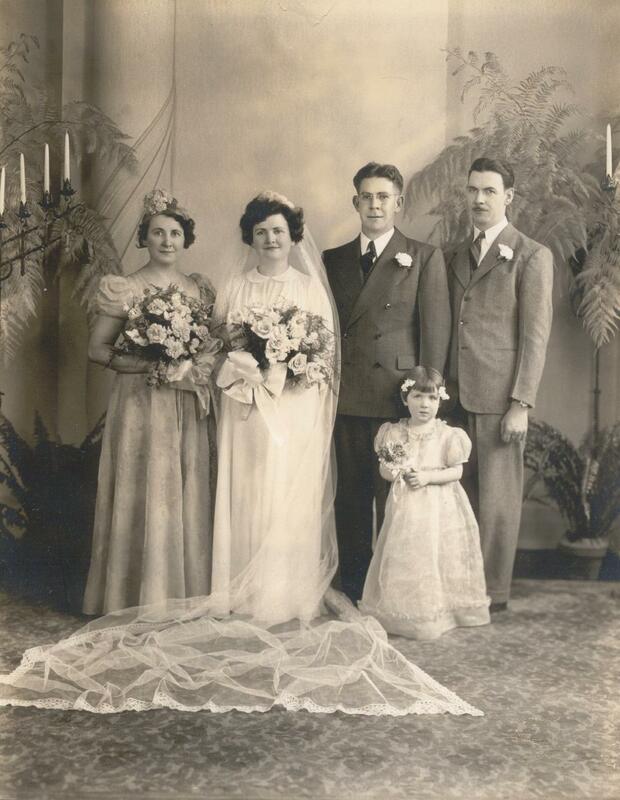 Tom wed Mary Foley on June 9, 1904 at St. Malachy Catholic Church in Clontarf, Minnesota. The couple grew up about a mile apart on farms in Tara Township. They had seven children – four girls and three boys. Grandma said she could tell her dad felt as bad about the situation as she did. The two of them sat on the buggy while Grandma finished her dinner. Grandma learned her lesson, and this was the first and last time Tom raised his voice. According to my grandma, her dad was a true farmer. He loved everything about the process – preparing the soil, planting, growing crops, harvesting them, and sharing the fruits of his labor. 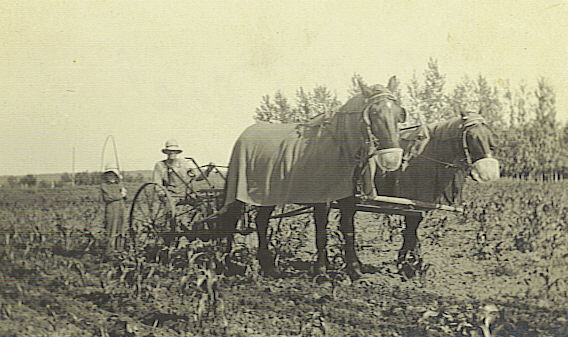 Unfortunately, the 1910s and 1920s were tough on many farmers on the prairie of Western Minnesota. Tom tried to make a go of it several times. He sold the homestead and moved to rented land, farming until 1926 when he gave it up for the last time. The McMahon family moved to Minneapolis to begin life anew. Tom worked in the pole yard (telephone poles) for several years before he retired. A neighbor let Tom use a plot of vacant land nearby. Tom grew “every vegetable known to man” on that piece of land. My grandma said he never seemed happier. Tom had a nifty little trade set up whereby he exchanged fresh produce for groceries at the local shop. Grandma admitted that her dad gave away a lot of produce to neighbors throughout the 1930s. She said everyone did what they could to help each other out during the Depression. Tom McMahon died on May 6, 1937. His wife, Mary, went out that day with a friend. When she returned home, she found her husband of nearly thirty-three years slumped in his favorite chair. One thing that Mary always said was that no one should be alone when they die, and she felt terrible she was not home for Tom – she was always home. Because my grandma shared her memories of her loved ones with me, these relatives I never had the privilege to meet came to life for me. This is how a great-grandfather who passed away thirty-five years before I was born can be one of my Irish American favorites. I feel like I knew him and now it is my job to keep his memory alive, for my grandma. 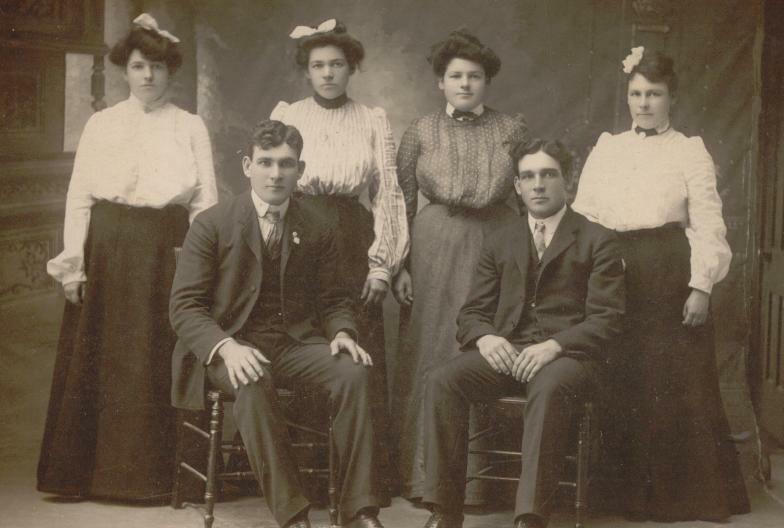 Tom is seated on the left, pictured with his sisters and brother. Categories: Irish American Faves | Tags: Clontarf, farmer, great-grandfather, McMahon, Tara Township | Permalink. On occasion, a reader of the blog will leave a comment wondering if anyone has information on a specific Irish ancestor or family or even an Irish relative or friend who made their way to America. These comments quickly become buried as new posts move to the top of the page. I would like to give a few recent comments a bit more attention here…take a look, and if anything strikes a chord, leave a comment. I will put you in touch with the source! Carol’s interested in these names from County Carlow. I just learned from a comment on another blog I write that the Kavanaugh family who settled in the railroad town of Clontarf in Western Minnesota came from Bunmahon in County Waterford. This caught my eye since I actually drove through Bunmahon while visiting Waterford this autumn. John commented that he had heard that several families who settled in Clontarf, Minnesota in the late 19th century had come from Bunmahon. This was news to me. Anybody out there know anything about emigration from Bunmahon, County Waterford? Hope you all have a wonderful weekend, and if any of the names or places on this page sound familiar, please drop me a line! Categories: Emigrants | Tags: 19th century, Boston, Bunmahon, Carlow, Chicago, Clontarf, Jacob, Kavanaugh, Minnesota, Mulligan, Pierce, Reidy, Sligo, Walton, Waterford | Permalink.